Ever since I did my post on individual Beef Wellington’s, I’ve been wanting to do something similar using chicken breasts. Instead of layering with paté and mushrooms, I decided to stuff the chicken breast with a cream cheese filling mixed with onion, garlic, fresh herbs and spices. As if that doesn’t sound great on its own, I decided to take it up one notch more but encasing the whole thing in buttery puff pastry. 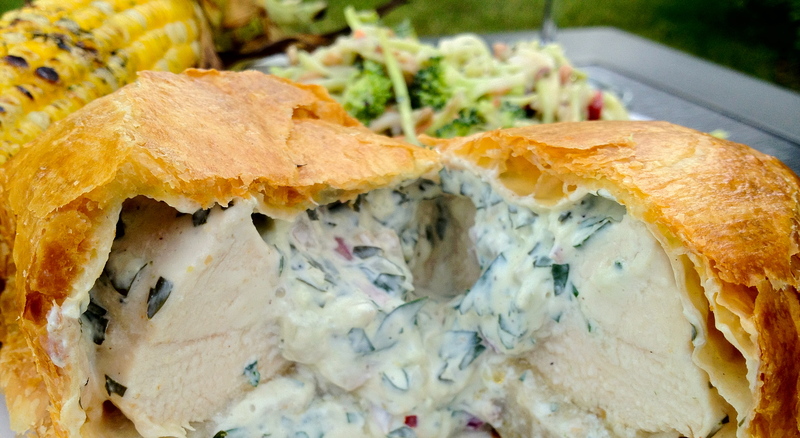 The result is a beautifully browned crust that once broken open reveals a perfectly moist chicken breast with a rich gooey filling. 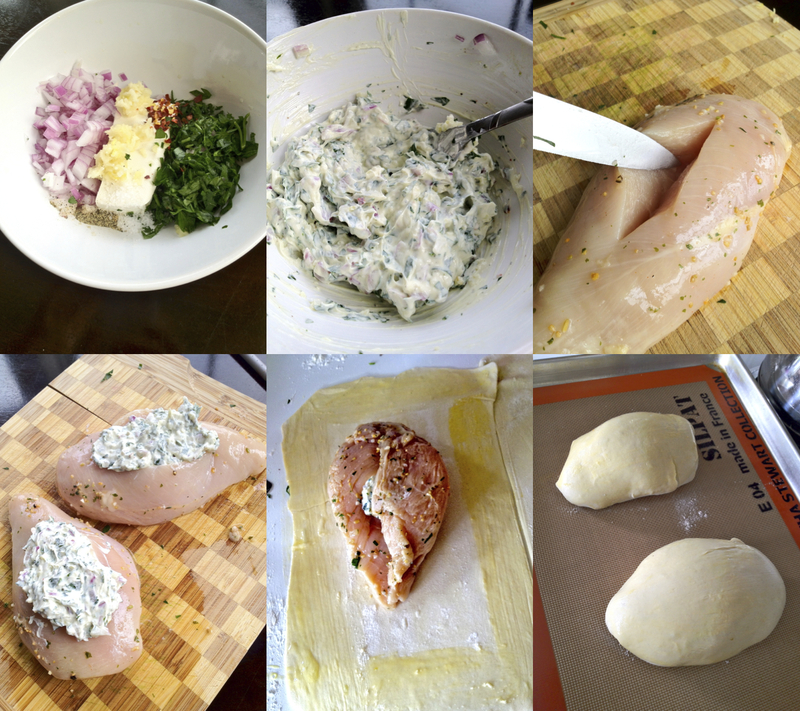 This recipe makes 2 stuffed chicken breasts, but can easily be multiplied to serve more. Preheat your oven to 400 degrees. In a small bowl combine 3 oz softened cream cheese (I used fat free since this dish is really rich), 2 cloves minced garlic, 1/2 finely chopped red onion, a big handful of chopped fresh parsley, a pinch of red pepper flakes (optional) and a pinch of salt and pepper. Mix well with a fork. Cut a slit in the middle of 2 boneless skinless chicken breasts (I marinated mine in fennel, garlic and a little olive oil) and then divide the filling evenly between the two breasts. Cut two pieces of thawed frozen puff pastry sheets big enough to cover each breast. 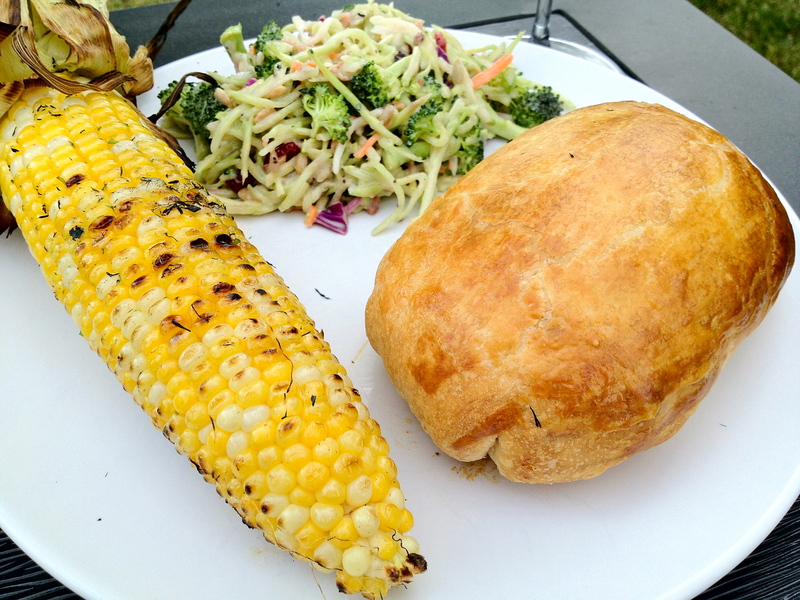 Lay the chicken, stuffing side down, on the pastry. Beat one egg with a fork and brush it around the perimeter of the pastry. Fold the pastry up just like a present and lay the wrapped chicken, seam sides down, on a silpat or parchment lined baking sheet. Brush with a little bit of the egg wash and bake until cook through and golden brown (30-35 minutes). 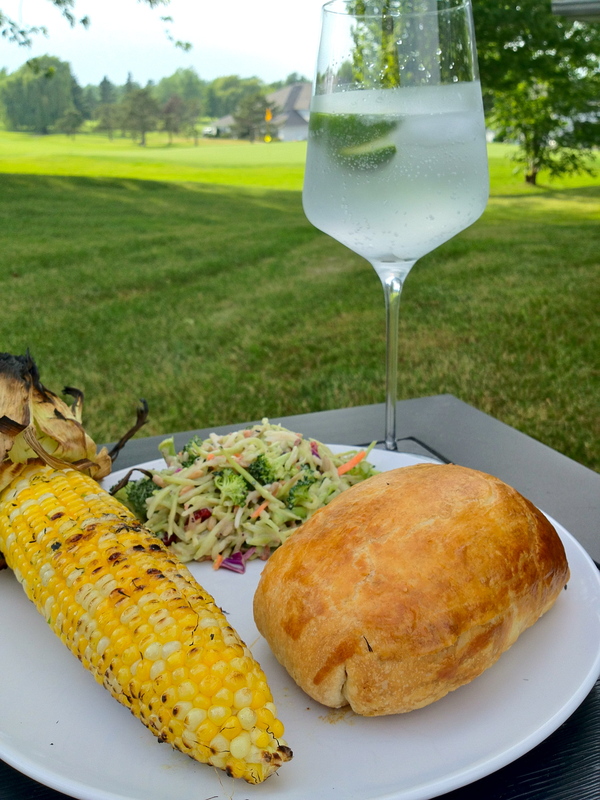 I served ours with some corn that we charred on the grill. 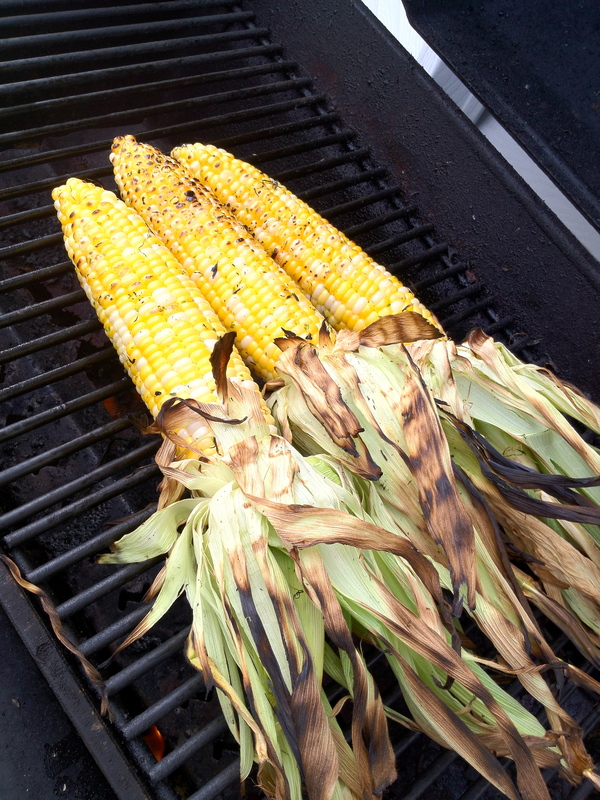 Just brush ears of corn with a basting oil (or olive oil) and lay on a high heat grill until desired char. Be really careful if you’re going to leave the husks on, after a while they will catch on fire so watch them carefully. I also made a salad with some thinly sliced cabbage and carrots mixed with broccoli, sunflower seeds, dried cranberry and a yogurt slaw dressing. Thanks they were so delicious! We are too lucky with the view from our back patio which is the grass you see in all the pictures!